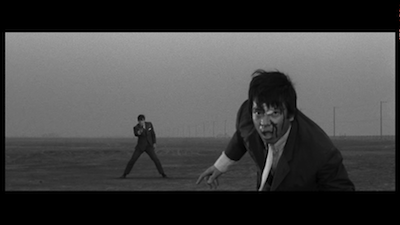 The final film in the Nikkatsu Noir boxed set is easily the best. 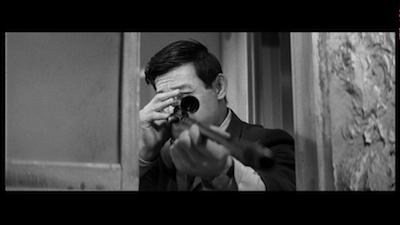 Takashi Nomura's 1967 fugitive picture A Colt is My Passport stars Joe Shishido as a hitman on the lam. Paid off by one crime boss to kill another crime boss, his plans to scarper out of the country with his partner, Shun (Jerry Fujio), are scuttled by the dead man's loyal gunmen showing up at the airport to block their way. One ingenious getaway later, and the two guys are hiding out by the wharfs, missing one departing ship after another, their freedom receding over the horizon. 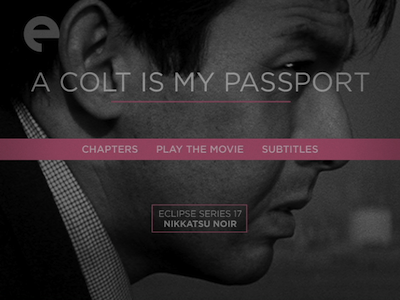 A Colt is My Passport is at once both methodical and maniacal. In executing the hit, Shishido's Kamimura is precise and cold. Yet, the bold nature of the killing is anything but. Told he has to produce a confirmed kill before he gets the rest of his money, he chooses to shoot the mark when he's right next to the man that's paying him. While shuttling back and forth between hotel and harbor, Kamimura never panics, he is always calm. At the same time, the final shoot out is about as gutsy as it gets. Kamimura photographs the sequence on a wide-open lot, with no visible landmarks or buildings. Kamimura says it's a landfill, but it could just as easily be the plains of an American desert. The harmonica and brass-laden score by Harumi Ibe self-consciously borrows from Ennio Morricone's spaghetti western compositions. It's so we make no mistake: Joe Shishido is cast from the same cynical, upstanding mold as Clint Eastwood's nameless loner. On the other hand, Kamimura also has plenty in common with American noir protagonists. Unlike Eastwood's Man with No Name, Kamimura has a partner. In this, he is much like a Bogart private eye, and just like Bogie went to bat for his cohort in The Maltese Falcon [review], so does most of Kamimura's motivation on the backend of A Colt is My Passport come from a code of ethics that demands he stand up for his brother. There is an underplayed--so, of course, possibly unintentional--homoeroticism to their bond. 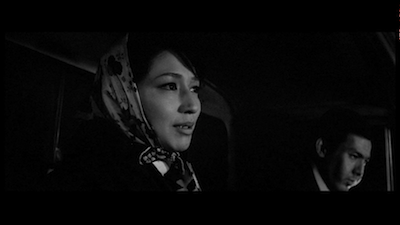 Chitose Kobayashi, who plays Mina, the ostensible love interest, at one point comments that she wishes she could have the same friendship with a man as they have with each other. She even lies to try to get Kamimura away from Shun, the ultimate no-no. (I mean, come on, has Mina never even seen The Maltese Falcon?) Mina's tragedy is that men regularly fail her. They are more concerned with their games, whether it's the posturing hood (Hideaki Esumi) who killed her previous lover or this new leading man with his over-pronounced sense of duty. Mina is trapped in a heartbreaking pattern, both literally and metaphorically. We are told that she has tried to escape this life many times, only to chicken out at the very last. Kamimura's gift to her, even if he won't go with her, is to make sure she leaves once and for all. Director Nomura and his cinematographer Shigeyoshi Mine (Tokyo Drifter [review]) experiment with extremes in A Colt is My Passport. Like Leone, they like to move in close on their anti-hero's eyes. They also like to show technical details: the mechanics of putting together a gun or other weapons, or the tricks the guys pull to get out of a jam. Mine's clear photography takes great advantage of the seaside locations. The vast openness of the sea is ironically contrasted against the cramped motel rooms that the killers hide out in. Freedom is right there, they can see it all around, they just can't get to it. In the landfill, Kamimura can run all he wants, as far as he can in any direction, and he'll still get nowhere. 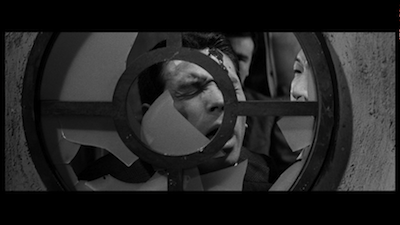 When Shun is beat up, he has his face pressed against a round window, a cruel reminder of the portholes on the ships that keep leaving without him. There's no fuss to A Colt is My Passport. A problem arises, Shishido handles it, he picks up the pieces and wipes off the fingerprints, and he takes his next step. There is no room for error, anger, or romance, even if all three present themselves. There is only getting the job done. 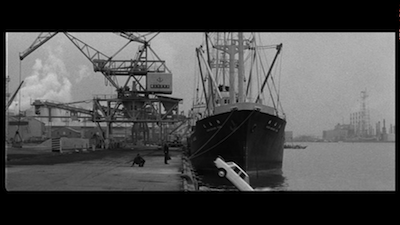 In that, Takashi Nomura is fantastically successful, creating one of the best Japanese crime pictures of the 1960s. 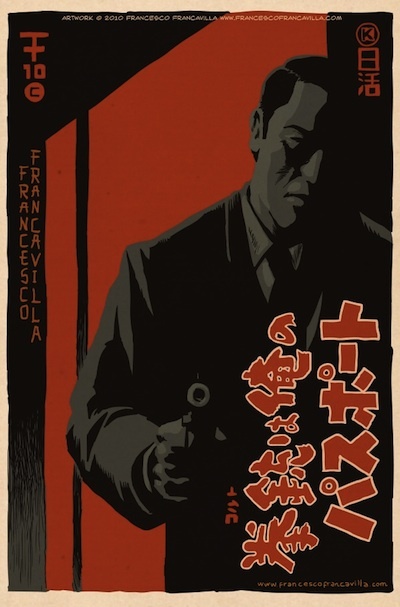 BONUS: Check out this cool tribute to A Colt is My Passport drawn by Francesco Francavilla. Check out Francesco's website for tons of movie, comics, and pulp-related art.